Each century its own. The 19th century was owned by Krakatoa and Tambora. (The mystery volcano of 1808/09 should probably be added to make it a list of three, but it is hard to credit the unknown.) The 20th century was the century of Pinatubo (1991) and Mount St Helens (1980). There were other eruptions, of course. Novarupta (1912) rivalled Pinatubo in size but in the publicity stakes it did not get anywhere near. The deadliest eruptions were Pelee (1902) and Nevado del Ruiz (1985), both smaller eruptions which happened to badly affect nearby population centres. As an aside, compared to previous centuries, Indonesia played only a minor role in the 20th century. But there is one event that is among the most significant but most overlooked eruptions of the century, a Pinatubo look-alike. El Chichon is the one that got away. The obscurity was already there even before the beginning. To the locals, the mountain peak was hardly notable. The region was heavily forested, and in the series of peaks there seemed little that set El Chichon apart. At 800 meters above the surrounding country side, the 1260-meter high peak was less tall than some other peaks in the area. And in any case, there was little evidence for any volcanic activity. Mexico’s volcanoes are mostly further north, in its central zone, while to the south the Guatemalan volcanoes cluster together near the Pacific. El Chichon is mid-way between, an isolated, small volcano in an area that does not seem to be particularly volcanic, neither close to the Pacific nor to the central zone. Its unassuming nature it had in common with Pinatubo, a decade later. This image, courtesy of GVP, was taken in 1973 by Paul Damon. The ridge in the foreground is the edge of the central crater of El Chichon. The peak is the dome at the centre of the crater (it no longer exists). The tree cover shows how little activity there had been, and the cut squares show evidence of human activity. El Chichon is certainly remote. It lies mid-way between Tuxtla Gutierrez, the capital of the state of Chiapas, and Villahermosa, capital of Tabasco, each about 70 kilometer away. There are towns in the area but the remoteness meant that it was never monitored. Neither was there much suggestion that it should be: this volcano seemed safely dormant or extinct, and Mexico has many much more urgent volcanoes. In view of the importance of the unexpected eruption, it is a pity that it wasn’t seen as more of a priority. Much of the run-in of the eruption was now missed, and even the eruption itself was poorly observed, not helped by the unerring scheduling which made each of the major explosions happen at night. The mountain consisted of an outer crater rim, 2 kilometer in diameter, with a main central lava dome, several small domes to the northwest and southeast of the crater, and one crater structure inside the outer crater. Two rivers collect water from El Chichon: the Platanar river from the NE flank of the volcano and the Susnubac– Magdalena river from the SW flank. Both are tributaries of the Grijalva river which flows towards the Gulf of Mexico. In hindsight, the activity had started in 1930 when locals reported hearing sounds from the mountain. Local stories told of a possible eruption a century earlier. A geologist, Frederich Mülleried, visited and he found that in the moat between the dome and the crater rim there was strong fumarole activity. After his 1932 report, the mountain became classified as a volcano. Shocks were felt in 1964, but nothing more happened until minor earthquake activity started in 1980, continuing into 1981. in December 1980 and January 1981, two geologists, Canul and Rocha, conducted fieldwork in the area for the purpose of hydrothermal energy surveys, and they heard and felt ‘strong noises and small earthquakes’ coming from the crater. They stated in their report that there was ‘a high volcanic risk’. But this report was not released by the Comisión Federal de Electricidad for whom it was written. This was an important missed opportunity. On 26 February 1982 intense seismic activity began, starting with an M2.9 and reaching up to M4 in mid-March. There were 10 or more earthquakes per day, at a depth of some 5 kilometer. This was detected on a nearby seismometer network, installed in 1979 to monitor a dam, but the data was not inspected until after the eruption. This was another missed opportunity. Scientists only became aware of the local reports of the seismic activity on March 20. On March 26 they attempted to set up monitoring stations on the mountain but their helicopter flight was cancelled and rescheduled for March 29. This probably saved the lives of the scientists involved. On March 27 the earthquakes became much shallower, around 2 kilometer in depth, and increased in frequency to 60 events per day – again, this was only detected in hindsight. March 28, 1982, was the fateful date. After 9pm, the earthquakes ceased. This probably indicated that the rising magma had fully filled the conduit. For 90 minutes the earth remained quiet, until, just before midnight, at 11:32pm local time (5:32 GMT), the mountain exploded in what has been called a phraetoplinian event, i.e. driven by vaporising ground water. The eruption lasted a few hours. This being night in the pre-webcam era, it was not directly eye-witnessed, at least not by survivors. Weather satellites picked up the eruption 40 minutes later. By that time, the cloud had spread north-eastward, over 100 kilometer in diameter, and had reached well into the stratosphere, 27 km high. By morning, it covered the Caribbean from the Yucatan to Haiti. The local area suffered ash fall, mainly to the northeast where the ash was 5 centimeters thick at a distance of 70 kilometer, and 15 centimeter at 20 kilometers. Worst affected was the northeast flank of El Chichon. In the village of Nicapa, 7 kilometers from the summit, a church sheltering refugees from the eruption collapsed, brought down by an M3.5 earthquake. 10 people were killed and many more injured. Further fatalities occurred to the north, caused by the fires which had been ignited by the hot ash. The numbers are not well known but it is estimated that some 100 people died overall on that night. Photos taken a few days later showed that a quarter of the lava dome had disappeared: the eruption had come through a narrow vent in the dome and partially destroyed it. Confusion reigned among the local population. Villahermosa remained dark for several days, with limited visibility even at mid-day. The green jungle of eastern Mexico was coloured white-gray by the ash and even ships in the Gulf of Mexico reported ash fall on their decks. Farmers were seen walking from one village to the next trying to find out what had happened. On March 30, two more explosions followed, a smaller one at 9am and a bit larger event at 3pm. The southerly wind spread the clouds and haze to the north, reaching Mexico City. Even at this distance, 700 kilometer, the visibility was reduced to 3-8 kilometer. There was a small explosion the next day, but otherwise the volcano seemed to be calming down. Over these four days, there were six explosions in total. These were again phreatic: ground water was interacting with the hot rock. There was little ash and tephra from these smaller eruptions. In the mean time, the Mexico emergency plans had sprung into action but, being untested, had ran into some problems. The plans were not designed for a major eruption. They relied on bringing in personnel and equipment by helicopter and plane, but this was not possible: the air space over south-eastern Mexico was closed because of the ash. It also required a presidential order which took a day to obtain. The plans came into action on April 1. In the mean time, the limited management showed. Roads became clogged with people fleeing the eruption, hindered by a counter flow of people coming to rescue their relatives. And this on poor roads covered in thick white ash. Still, the army started evacuating a large area around El Chichon, out to 15 kilometer from the mountain and covering over twenty thousand people. This commendable action may have avoided massive casualties in the events to follow, but it also met problems. 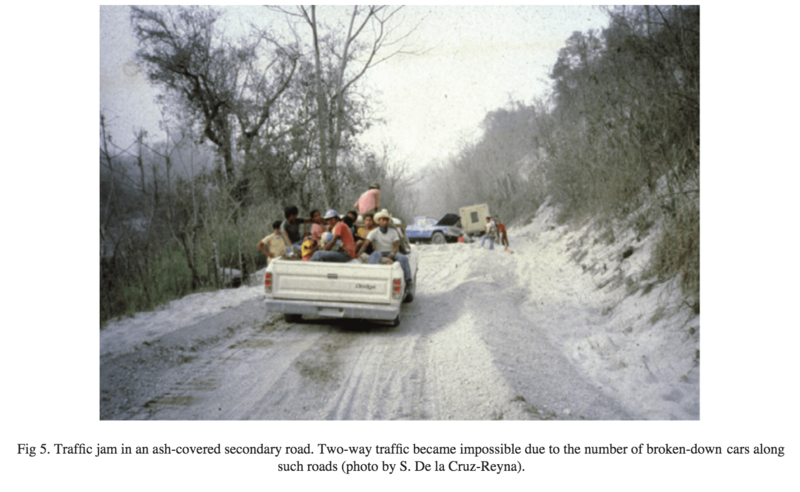 The impassable roads made it impossible to reach the communities nearest the summit, and people there had to decide for themselves whether to evacuate or not, without reliable information. Scientists were not sure whether the eruption had finished, and an unnamed chief scientist advised the army that the danger had passed. The seismologists who knew better had not been invited to these meetings. This uncertainty led to the evacuation order being rescinded on April 2nd. The relative calm also encouraged people to try to return to their homes. They walked into the fire. On the 3rd of April around 02:40 in the morning, as later determined from the seismic record and from atmospheric waves recorded in Texas, the eruption resumed. The story becomes more complex at this point, because after this the seismic records begin to diverge from local reports and papers. The 02:40 eruption was large but less than the first one. However, it was followed by a very major event at 03:00. These two events became conflated in the reports. The second one was probably the explosion that destroyed the dome. The force of this blast has been reported as almost 100 kilo-ton of TNT, and the atmospheric pressure signals as similar to an atmospheric nuclear explosion. Being the middle of the night, eye-witness reports are scarce. The deposits contain evidence for water: this was a major phreatic event, perhaps when rising magma had reached the groundwater table. Near the summit, Volcan village was buried under 80 cm of ash, but further away, Nicapa only had 7 centimeters. This suggests a ground blast, where the ash column did not reach any great altitude. After this, there is less evidence of water in the ejecta, and it seems the ground water was now exhausted. Water-loaded flows will have temperatures up to 100 C, while dry flows can be much hotter: charcoaled trees after a pyroclastic flow are evidence that there was less water. Both types of flows occured at El Chichon. The explosion set the scene for the next, and final, events. That evening, at 19:35, a major eruption occurred, which is reported by some as the largest event of the El Chichon eruption. The column reached a height close to 30 kilometer. And it was certainly very large, with a total energy was similar or larger than that of the preceding event. During the next few hours, the eruption fluctuated, with explosions every few minutes. A mushroom shaped cloud was seen. Again Nicapa was in the line of fire, with ash up to 40 centimeters thick and many roofs damaged from the falling stones, up to half a meter in size. But even with this devastation, the village was found to have had a lucky escape. Two pumice flows coming down the mountain had reached to about 2 kilometers, containing rocks up to 1 meter in size, and a pyroclastic flow had covered the same path, strong enough to topple trees and leave a thin layer of boiling hot ash. Scientists at Ostuacan, 11 km from the mountain saw the first explosion, being warned by their seismograph. Later they saw the glowing pyroclastic avalanche coming towards them. Once the ash fall started, visibility went down to meters. The pyroclastic flows and surges coming down the mountain had in fact reached 7 kilometer from the summit in all directions. This devastation only became clear later. The time of these devastating pyroclastic flows is unclear. Early papers attribute them to this final, huge explosion. 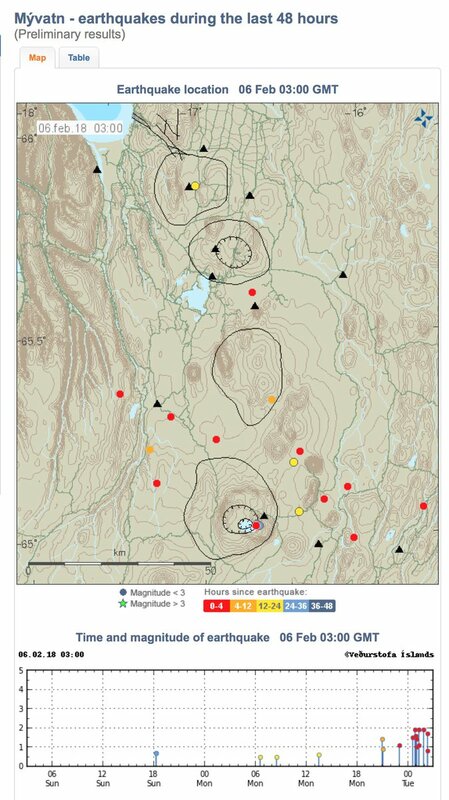 But other evidence suggest that they happened during the previous eruption, in the early morning of April 3rd, rather than the subsequent evening. This discrepancy shows how difficult it can be to piece together a complex eruption, especially when it happens at night amidst tremendous confusion. People close enough to know what happened did not survive. The deposits show that the pyroclastic flows had come before the associated tephra falls. This order is unusual for plinian eruptions although not unique – there are examples at other volcanoes. To get an early pyroclastic flow, either the eruption column needs to collapse very fast, or the flow must come directly from the crater. What perhaps happened is that the explosions had fully removed the old dome, and there was suddenly much less weight pushing on the magma chamber. The release of this pressure caused the volatiles to come out of the magma, including the penetrating ground water, causing the entire magma chamber to explode as well. The cold debris flow was probably crater rock fragmented by the explosion. The hot pyroclastic flow came because this cold fragmented rock made the eruption column very dense. The hot gas was unable to carry the weight and a mix of cold debris and hot pyroclastics came racing down the mountain. The deposits left by these flows and surges are up to 15 meters thick. Some were stopped by the outer crater wall, but the gaps in this wall let the flow enter the steep valleys. The flows raced down, until the gradient shallowed and the cold flows slowed down and settled. Nicapa had come off lightly, being just far enough away. Much worse had happened elsewhere. Nine small villages closer to the summit than Nicapa had been destroyed: Volcan, Tanchichal, Francisco Leon, Guayabal, Trinidad, Naranjo, Yaspac, Volcan Chich6nal and the western part of Guadalupe Victoria. Some of these had already been abandoned, apart from a few people looking after the crops, but Francisco León, 5 kilometer from the summit, had a population of about 1000, of whom half were still there. About 300 to 400 people died there, including a geologist, Salvador Soto Pineda, who was part of the scientific team studying the eruption. Nearby, a river was seen to boil but the heat made it impossible to approach. On April 4, at 5:22 in the morning, the fourth of the large eruptions came. There were two separate explosions, 8 minutes apart, followed by several hours of activity. Weather satellites showed that the ejecta had again penetrated the stratosphere, and a huge sulphur-bearing cloud began to spread. This eruption caused extensive tephra falls and a variety of pyroclastic flows. Again the north-eastern region bore the brunt of tephra fall. At this time, visibility in Ostuacan became reduced to about 20 meters. The eruption was now largely over, apart from a minor event on April 5, but the impact continued. The pyroclastic debris had blocked some of the rivers. The worst case was on the Rio Magdalena, to the southwest, which was now crossed by a 50-meter thick debris pile. The river continued to bring in water, and a 5-kilometer long lake developed, covering the hot pyroclastics. On May 26, the dam gave way and within an hour, the lake emptied. People living in the danger area had already been evacuated. The most remarkable thing was the heat of the lahar. Ten kilometre downstream, a water temperature of 82 C was measured. A hydroelectric plant further downstream still had people working in it: three people suffered bad burns from the water and one person died. In hindsight, there were local Mayan legends about a boiling flood in the area, which may have referred to a similar event in the long distant past. But before the eruption, such stories would not have been understood. El Chichon is listed as a VEI-5, both because of the tephra volume and the height of the eruption columns. The tephra amounted to 2.2 km3. The dense-rock-equivalent is of course rather less than the tephra, but even that is estimated at 1.1km3, with a minimum of 0.5 km3. The original lava dome had a volume of 0.16km3; the new, 300-meter deep crater may add another 0.1km3. This fits the minimum DRE, but for the larger amount that is commonly listed there is a ‘missing rock’ problem: the ejecta seem to need more volume than can fit into the hole the eruption generated. The remainder must have come from excavation of the surface beyond the new crater, and from subsidence caused by the emptying of the magma chamber. It is not immediately obvious that these two suffice. Perhaps there had been considerable inflation before the eruption, or the amount of DRE ejecta is somewhat overestimated. The total number of fatalities is not well known. This was a remote jungle location with few records of who lived where. The most complete records were from the local churches, and these indicate that some 2000 people disappeared, presumed dead. Most of the casualties probably occurred in the early morning of April 3rd. There was widespread economic impact of course, in loss of agriculture, but this was manageable for Mexico. The climate effect is often mentioned. El Chichon produced an unusually large amount of sulphur, compared to the size of its eruption. Sulphur is a bit of a common thread in the area: 60 million years earlier, the impact that killed the dinosaurs has been so devastating in part because it hit the sulphur-rich rocks of the Yucatan. 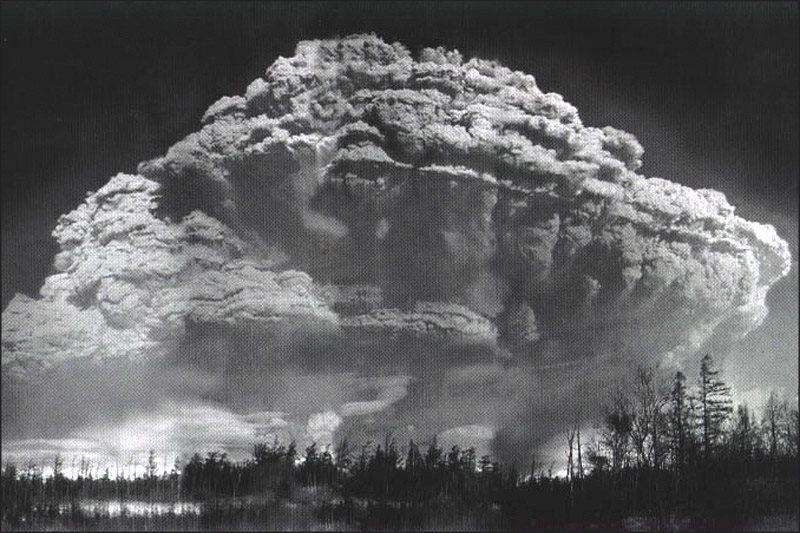 El Chichon was similar in size to the eruption of Mount St Helens, but it produced 7 times as much SO2. The ash contained up to 2 weight percent sulphate. Anhydrite (made of CaSO4) crystals were also in the deposits. Anhydrite is rare in volcanic rocks. The large amount of sulphate entering the atmosphere could have given a significant cooling. Heating in the upper troposphere was indeed seen. This is the first indication of cooling (because the sun’s rays are absorbed at high altitude, these high altitudes warm up whilst the ground cools down. The CO2 greenhouse has exactly the opposite effect: the ground layer warms but the shielding of the ground radiation cools the upper atmosphere.) But in fact, rather little effect was seen in global temperatures, with at most a small short-lived dip. By coincidence, a strong El Nino had just started and this counteracted the cooling effect. It kept the temperatures too cool for a strong El Nino and too warm for a volcanic winter – but just about right for the time. Of course this was just before the strong global warming started to dominate the climate – it was considerably cooler than the current climate. After the eruption, El Chichon had lost its lava dome and in its place there was now a 300 meter deep crater, 1 kilometer wide. The outer rim was still there. The forest was -and remains- gone. The height is less than before because of the loss of the central dome: it now peaks at 1100 meter. El Chichon is unique in location and in the composition of its ejecta. But it does not stand alone. It is part of a minor volcanic belt called the Chiapanecan Volcanic Arc. It is the youngest, and the only non-extinct volcano in this belt. The belt runs from El Chichon to southwest, parallel to the Pacific coast. It ends where the Guatemalan volcanoes begin, following a line much closer to the Pacific. Out in the Pacific, the ocean floor shows a linear feature pointing straight at El Chichon. This is the Tehuantepec Ridge, and it is part of the Cocos plate. It seems hard to believe that it would not be connected to this unusual volcano! But the precise relation is not clear. One suggestion is that this ridge is a fault which allows water to penetrate down. As the Cocos plate and its ridge subduct, the water causes a serpentine layer to form in the mantle wedge above the subducted plate. The serpentinization allows melt to form, and this feeds the volcanic activity. The model is illustrated here. 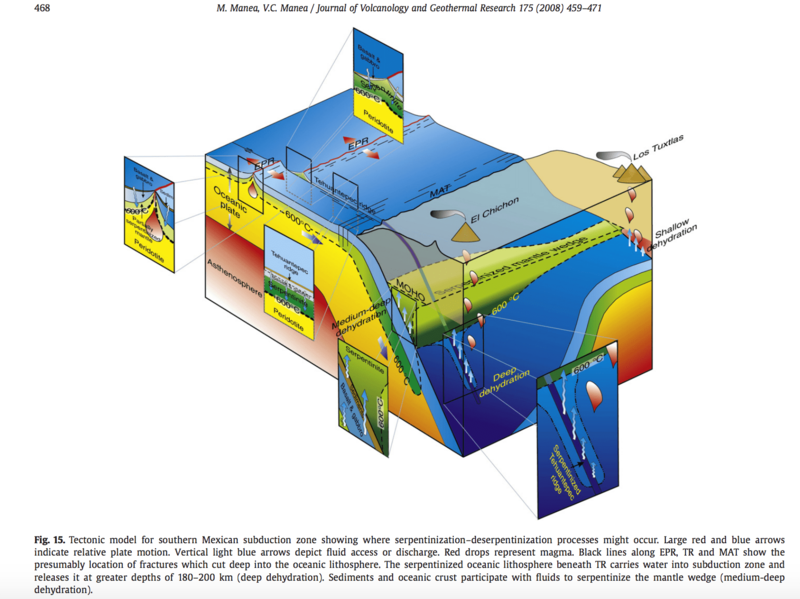 However, El Chichon may be a little far downstream of the subduction, for this model. More research may still be required before we can understand why El Chichon lives in isolation. El Chichon is in fact part of an ancient complex. The oldest structure is a crater situated 4 kilometer to the northwest, which is dated to 1.64 million years ago. A dike extended 14 kilometer southwest, following a fault line: this happened 1.1 million years ago. El Chichon itself began to develop at its current location some 370 thousand years ago. The outer crater, the Somma, is dated to 250 thousand years ago. At the time, the full volume of the volcano would have been about 18 km3 – this was never a large volcano. Various smaller peaks on the slopes around El Chichon are now seen as related volcanic ‘lateral’ domes, emplaced since El Chichon began to develop. One of the domes caused the collapse of the southwestern rim of the Somma crater, and thus formed after the Somma. The lateral domes tended to explosively self-destruct. The latest of these was the Guayabel cone, 3 kilometer southwest, which left a horseshoe collapse structure on the side of El Chichon: this may have happened as recent as 10 thousand years ago. In addition to these secondary domes, the central crater has re-activated a number of times even during the Holocene, the latest such event happening in 1982. The earliest dated event was at 8500 BP. It was followed by 4000 years of quietness or minor eruptions only. It is worth pointing out that the rainfall in this area can be phenomenal (perhaps explaining the hydro-magmatic nature of this volcano), and erosion rates are therefore also high. Quite a bit of history may have been lost. The deposits suggest that a major eruption occurred 4000 BP, followed by 600 years of dome building, which subsequently blew up. Now the crater remained open for another 600 years until another explosion occurred. Activity resumed 2000 BP, with several explosive events within a few hundred years. A dome developed, and blew up around 1500 BP. 250 years later, a plinian eruption occurred from an open conduit, and 900 BP this repeated itself. A large eruption happened around 550 BP. After that, the new dome developed, until it was destroyed in 1982. There is evidence for at least 11 eruptions during the past 8000 years. The recent recurrence time is about 300 years. The 1982 event was fairly typical in size: this volcano does VEI 4’s and 5, but would have difficulty with larger eruptions. The eruptions of 1400 AD (B in the table below), 700 AD (D) and 1900 BC (K) may have been a little larger than the 1982 event. Some of the events were similar in that a central dome was blown up. Others appear to have occurred from a vent, taking place in an environment similar to the current situation of a crater with a lake. 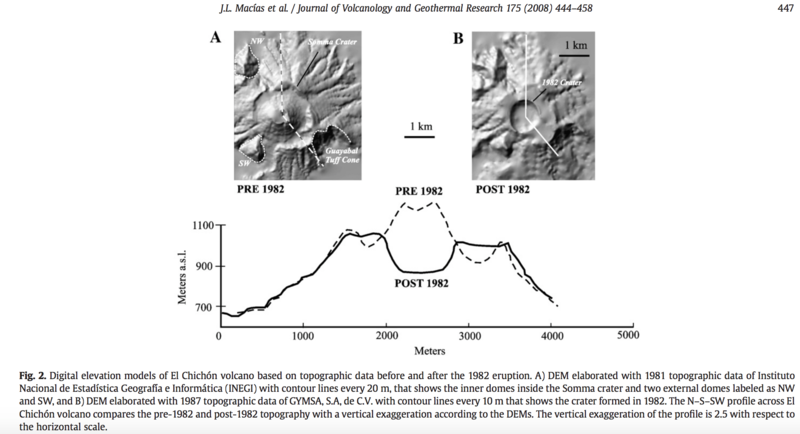 This history shows that El Chichon has always been a dangerous volcano. It wasn’t large enough to devastate huge areas, and never has done eruptions that are global in impact. But locally, it could have wiped out communities living along the rivers, and over much of the east of Mexico and the Yucatan it could have given a troublesome covering of ash. However, claims that this volcano could have played a role in the collapse of the Mayan empire seem overstated. There are bigger beasts further south more likely to have done this. There is an important point to make here, though. El Chichon was not recognized as a volcanic danger, because it had had no historical eruptions. The recurrence time was too long for either human memory, or for written history. This is actually quite common. A significant fraction of large eruptions come from volcanoes without a living history of such. Pinatubo and Krakatoa come to mind, but so does Vesuvius in Roman times. (And in this context, the recent developments in Öræfajökull may sound a warning bell.) Add to this that a volcano that self-destructs regularly never builds up a traditional volcanic edifice – so it may not stand out in the landscape. Its danger is hiding in the shadows. And that is the message, loud and clear, of El Chichon. And I had the pleasure of visiting this volcano in 2010. Thanks for the article. Found this video as part of the ongoing #volcanocup on twitter. Thankfully, Yellowstone is out of the cup, but this is a nice overview of geological recent activity in the Pacific Northwest. Interesting read. There’s probably lots of volcanoes like el chichon that are underestimated until they have a big or damaging eruption, then study shows they have a long history of big events. Pinatubo was almost like that except its eruption history was determined and acted on before it actually erupted which probably stopped it from being in the 20000 death range or more. This is m thought also, how many seemingly low-risk volcanoes are not being monitored? Also a similar situation to Chaiten. 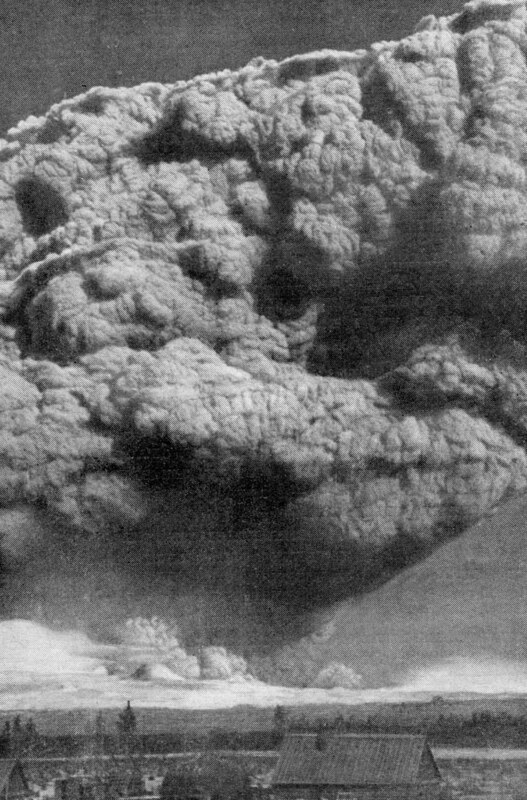 So that’s El Chichon, Hudson 1991 and Pinatubo (main event) for which we have no images of the eruption column of the climactic eruptions, so the largest explosive eruption we’ve properly “seen” is St Helens! That is a really interesting observation! There are a couple that scared the cr@p out of eleven-year old me when I first saw them. Never seen that first one before, that is incredible! That first one really puts last years explosion in its place… Klyuchevskoy is probably one of the biggest stratovolcanoes on earth when you consider base to peak height, and it looks like a little triangle next to that plume. Bezymianny is like the volcano equivalent of a wolf in sheeps clothing. Still though, a VEI 5 sounds a bit on the small side for being dormant for over 1000 years, maybe the main events are still in the future. Huaynaputina is another ‘low-prominence’ mountain that has a nasty habit of saying hello every few thousand years or so. Not volcano related, but since we love to talk about black swans, I wanted to share something that seems to be a black swan unfolding as of tonight. The idea of the black swan came about largely in response to the 2008 financial crisis. So in light of that, we have another potential black swan that is probably going to hit the worldwide financial markets pretty hard. Hopefully this doesn’t turn out to be anything bigger, but we shall see. I wouldn’t worry too much about the drop, it may be the largest point drop, but it was only a 4% correction. By comparison, 1987 was a 30% drop and 1929 was over 50% drop. Since the market is up nearly 25% since a year ago, we would need to see a 6K drop to really erase the recent growth. Chaotic variables revert to the mean over time, so the run up offsets the dismal decade since 2009. Personally, I think this was folks who though the Patriots were a sure thing cashing out to cover their losses. Guess, until yesterday, the Eagles winning the Super Bowl was a Black Swan event. Right, I understand all this, but there is more to it, and the situation is only starting to develop. The 1929 drop did not occur in one day, nor did 2008. I hope I’m wrong, but there is a lot more here than meets the eye. A lot of derivatives are based off inverse volatility, and there are other issues that I won’t get into as this is a volcano blog. But just wanted to point out this is highly worth paying attention to. Can’t say for sure. But one of the hallmarks of a swan is a probability that is so small it is assumed to be a non threat. Given that 2008 resulted in a shell game that moved toxic assets around and never processed the toxicity, 2008 was just put on hold. My opinion? Eventually it will play to completion. Math does that. Just don’t be standing in the wrong spot. could be wrong…. (thought i was wrong before; but i was wrong) —(joke)…. but a swan looks harmless/ peaceful/ but, surprise, it can kill you…… but whatda i know? A stock market crash is not a black swan. Because black swan are rare unexpected events. Unexpected by nearly 100℅ of people. So a crash is not a black swan. We have to imagine something weird, very rare, totally unexpected. For example Oraefajokull tomorrow does a VEI7+ or VeI8. Another example. Norway starts a world war next year after electing someone crazy. Another: a comet strikes Saturn and stirs the planet out of its orbit. We don’t even think that’s possible. Another one: these actually happened: a landslide off the coast if Norway stirred a giant tsunami. Or in 1607 a tsunami-like event strikes Bristol and Cornwall. No one is sure what happened back then. Now some positive black swans: Kim Jong Un makes peace with Trump and after an unexpected turn of events, then visits the US, in 2019, and vice-versa. 2018 sees a genious researcher discovering the cure for cancer, malaria, aids, and other diseases, with one single thing. Now some fun ones: Lady Gaga becomes US president in 2020 and establishes world peace. Who would guess? That is quite an obscure fund and if there is very little volume in a fund, it can respond dramatically. Overall, so far this is the expected down-turn which has undone the gains from the US tax cut. It probably has a bit farther to fall. But I would be surprised if it becomes more than that. On the other hand, the bitcoin saga shows that too many people are desperate to make some money and will put it into anything. That is a danger. But unless something major happens politically (or volcanologically), it shouldn’t become a crisis. It’s not quite as obscure as you think, at least in the finance world. There was over 2 billion of $ worth of inverse volatility funds on the market (which were basically wiped out). The real issue is that there is a much much larger market for either derivatives, or risk parity type funds that are all getting hit hard right now similar to this as a result of their dependence on a low volatility stock environment and an inverse correlation of stocks to bonds. In 2018, the narrative has shifted however as Quantitative Easing is starting to end and interest rates are rising, which now makes it so bonds have a positive correlation with equities, which completely screws up the system’s dependence on these volatility products. In short, a huge amount of $ has built up over the last 10 years that has ridden on inverse correlations of stocks and bonds. With bonds starting to see major sell-off’s due to central banks needing to end some of their policies, there is a lot of whiplash as this affects everything else, which then causes lots of deleveraging and increased volatility, which then could feed the system even more. They still need confirming. If all kind of locations and depths, it means there were a lot of reflections of the moho which made them difficult to locate. But note the swarming at Öræfajökull. Looking at the drumplots, there seem to be hundreds and hundreds of micro events (“popcorn”) all across the highlands right now. I wonder if those are frost quakes or something. Anyway, it seems likely to me that these could be causing the false detections. Yes, temperatures were quite a lot above freezing on Sunday up until Monday morning and have dropped significantly since. Thaw followed by rapidly dropping temperatures will set the conditions right for frost quakes. Jon Frimann said they were ‘frost quakes’ and sure enough they’ve pretty much all disappeared now. Move on, nothing to see here! Amazing post Albert. Thanks for taking the time to write it! Good read as usual. Thanks!! Would an El Chichon today be able to progress so far as to become critical without some detection? Kadovar’s initial eruption was a surprise but everyone was evacuated before the situation became really bad, where even those miles away were endangered. I wonder how much warning local PNG authorities had that something was up? Japan’s phreatic explosions are clearly an issue, but the victims were all close to the crater. I hope that the only volcanos that can go big without anyone immediately noticing are undersea ones like the Havre seamount or ones hidden under the deep ice in Antarctica. Is seismic and GPS monitoring near population good enough to keep this from happening again? Do we have enough curious/obsessed minds to go and investigate anomalies? I’m thinking of that obscure bulge in the Andes that got all the attention last year. As much as the click-bait coverage by the UK tabloids is annoying for anyone looking for real details, does this generate a market to employ Black Swan hunters? Google Earth has created the phenomenon of arm-chair archaeologists finding lost civilizations in the Amazon and Sahara? If Google added infrared and GPS changes to their data, could we all become amature volcanologists? Monitoring has changed beyond recognition since 1982. We would know much more about any volcanic activity near population. Away from that, perhaps not. Beerenberg could still erupt without recognized warning. The main risk nowadays is in the forecasting, and this is a very difficult problem. If a ‘risk’ phase lasts too long, people will return to their houses. And the actual eruption may still come as a surprise, even when the risk was known. That is something for which more research is needed. How long after a volcano goes quiet is the risk gone? It will vary per volcano. Could we have known that Agung would erupt but not explode? Not with our current knowledge, but perhaps in 10 or 20 years we can do that. Have just watched the falcon heavy lift launch. The return of the boosters are just far out!! Another fantastic article, thank you Albert. Big earthquake in Taiwan. It follows a foreshock two days ago. Sky reporting a building has collapsed people trapped. I’m still learning how to read the beach-ball diagram. I grock that if white wraps around shaded it means compression, while the opposite is extension; and if your can see the intersection of the P and T axises, that means lateral movement, slip or strike, I think, as opposed to thrust or subduction. But the overall orientation of the P-T intersection alludes me. What indicates oblique or normal? Is there any place where all the various orientations are explained along with all the various quake types? Dr. Gemma Smith (https://earthquake-report.com/2014/05/17/understanding-the-mystery-of-earthquake-beach-balls/) and Wikipedia have gotten me this far. Where is this amateur losing the thread? Can anyone break all the elements down in non-expert jargon? Did you watch the animation in that link? I think that video explains it better than I could ever manage to say it in words. Basically, the beach ball gives you two possible mechanisms for an earthquake, i.e. movement along any one of the two planes cutting through the lines separating the shaded part of the beach ball from the white. The potential direction of movement along each plane is given by what part is white and what part is shaded. Usually, the beach balls are drawn so that movement is from white to shaded. Which of the two planes is the correct one can only be decided by looking at additional data. Are there known faults and how are they oriented? Do aftershocks line up along the fault plane? I urge you to watch that video a couple of times. It really is the best way to illustrate what the beach balls represent. Three Booster, all landed under their own power. “Starman” is on his Tesla ride to Mars. is it actually going to mars? I thought it was just going to orbit. Reported that the center booster crashed into the sea. El Mayon: the update mentions continuing inflation. If that is correct, the eruption could worsen. But it may be based on a long term trend rather than current inflation. Maybe with the focus being on agung and kadovar as possible next big eruption candidate, this inflation at mayon has been somewhat overlooked. But if it is still inflating while managing to maintain the eruption where it already is then the scenario is probably one of either a more prolonged eruption or a VEI 4. I guess its kind of an opposite look on the situation this article is about, a well known volcano possibly being very underestimated and taking everyone by surprise. Yes I have read the NVDP article on mayon. I saw that too. What I drew from that is that inflation is ongoing, despite the current eruption; it’s going in faster than it’s coming out. Definitely bears keeping an eye on. the names of more than 6,000 SpaceX employees. Apparently the orbit was determined from the GPS in the car. I can imagine the navigation system getting a bit confused! The next instruction to the driver will probably be’Turn around when possible..’ The orbit is not quite as far out as in yesterday’s report, it does get beyond Mars but only a little. Apparently the rocket is not yet at the stage where they can predict exactly how much propulsion a burn-to-empty will give, so this is not a bad outcome. The period of the orbit comes out as 1.56 years. That means it will get close to Earth again after 7 of its orbits, in 11 years time, although ‘close’ is relative: 10 million kilometers. I can make an estimate of how long it can expect to play russian roulette with the Earth before it may hit us. Assuming it remains on an Earth-crossing orbit (so nothing perturbs it out of its orbit) I get some 100,000 years. It is probably not a self-driving car, and neither could the software do much to prevent the collision – hitting the brakes won’t help. We will just have to move the Earth out of the way. I was wondering if this weird plot on the All Sky Fireball Network was related to the Tesla, but the change in direction is between the orbits of Mars and Jupiter, which isn’t consistent with a near-Earth burn like you describe I suppose plot could be artifact of reverse plotting its course or just a coincidental glitch in the plot software It’s an interesting trajectory and I bet alien conspiracy fans could have a field day with this. Very strange. But I don’t know where this plot comes from. The link on spaceweather points at the nasa fireball site, but I have been unable to identify there which of these orbits corresponds to which fireball on the site. On the NASA site, none of the orbits for that day look like any of the orbits on your plot. The plot you show may be data of events that came after the daily NASA updated, in which case they would be unvalidated? Clearly something has gone wrong with the orbit calculations here. If you look at the NASA site tomorrow morning, after their daily update, you may see this event. As I understand it (based on a communique with Bob Lunsford from the American Meteor Society), the meteor orbital info is automatically generated, and is often relatively inaccurate. My guess is the strange meteor orbital plot is due to the Falcon’s third burn which occurred in the late evening over the SW U.S. about 4 hrs after launch and should have been easily visible by the New Mexico and the Arizona monitoring sites. Ground reports had the magnitude at around 1st magnitude. Correction: ~6 hrs after launch. As of yesterday, for El Mayon, the National Disaster Risk Reduction and Management Council reports that 16380 families remain evacuated (perhaps 60,000 people in total), as well as 608 cattle, 574 carabao, 7 horses and 14 goats. And on another note, according to the data monkey running in the background, VC is close to reaching 25,000 comments since moving to the current site. Another 10-15 to go..
Here’s a comment to top that up: thank you once again for a sterling article! Some strong ones at Oerafjellajokul, Iceland. Green star , very shallow! I think we will see an eruption there within 15 years. It’s heading in that direction. I wonder if the next eruption in oraefajokull will be the end of its ice cap. If its last few eruptions have been pretty big then there is a fair chance of the next one being similar, and the glacier will probably melt rapidly this century. Being the highest mountain in Iceland there would probably be some ice but the caldera might become filled with a lake instead of a glacier. Maybe the run up for this eruption will be similar to eyafjallajokull. Maybe the actual eruption will be too, small basalt eruption possibly on the flank, and then a much bigger eruption in the caldera. How long does it take for the glacier to fill in a crater formed during an eruption? Is the big crater formed on grimsvotn in 2011 still there or has it filled in? Close to sea level, I think, but experience has shown that ‘0.1km’ should be treated as ‘not well measured’. When monitoring at Bardarbunga improved, the 0.1-km depth disappeared and they were mostly a couple of km deep. It may also mean that the depth was above sea level: I think the system is not set up to deal with quakes that have an origin above the level of the seismometer network. At least that is my impression. The ice cap is probably secure – it is a region with a _lot_ of snow, and the summit is well above the level for permanent snow – at least for now. The ice cap is far too wide to disappear with an erution. I think we need something like 7° warming too see the top of Oraefajokull without ice. I wonder what’s going on with Agung around 10:00? Looks like temporary technical problems. Gamalama had an interesting plot too. Is this volcanic, weather, or human activity? Funny. It seems to have started without any warning. That makes me suspect an electrical fault, perhaps a lightning strike. But I don’t know. Not anything above yet here. so what does the ‘25,000’th commentor win???? 😉 Best! motsfo who is spending more time watching curling now… so don’t anyone do anything dangerous…. can You kids just be good for a while?? maybe if you were wearing a wing suit (and unlike me had a clue what you were doing while wearing one) you could base jump to get down fast enough – is there somewhere you could reach after the onset of earthquakes with enough vertical drop to get you launched – anyone know the topography well enough? I think you have to be going at near terminal velocity for a wingsquit to generate lift in something as big as a human (70-100 kgs). All the times ive seen them used they start in aircraft or on cliffs, so I dont think hekla is steep enough for you to be able to jump off the side of it. Also if you try to land just with the suit you would be landing at the flying speed, which as said above is pretty high… 🙂 The only way you might survive is by landing in a deep slow river but I would doubt any of the rivers are like that in Iceland and they are probably too far away. Easy solution: stand on Hekla and wait for an explosive boost! You will need protection from heat, blast, and acceleration. Vehicle design is slightly more complicated than a barrel suitable for surviving going over Niagara Falls, but not too much so. At the bottom is a Project Orion pusher plate. Shock-absorber springs connect this to a heat shield above, coated in Shuttle tile on the bottom. On top of that is an acceleration couch, or possibly even a tank with an incompressible liquid inside (in that case the passenger will require an air tank and mask). When the explosion comes, the passenger will be protected from heat and the worst of the gee-forces while being smoothly accelerated upward. Problem: then they fall back down right into a smouldering crater gushing lava. Ouchies. So the whole vehicle must be propped up by a support on one side, tilting it to an angle, so it will be shot off diagonally at 45 degrees (this angle maximizes horizontal travel, for a given magnitude of pushing force; ballistics 101). Now it will arc up and sideways from the summit, heading for a landing a good distance away. If the acceleration tank can survive impact at terminal velocity, good, If not, once the apex of the trajectory is reached the passenger would need to be ejected, then deploy a parachute to land safely. You get the honour of writing the next post! On the viscosity of gravy. And the winner is (sounds of drums..) Thomas A! And as appropriate for VC, it is with a comment to help someone else. Wow, thanks! I think I’ll save that right for later as I’m a bit choked by work at the moment. I will definitely try to get get back with something. There is a high probability that Iceland will be involved somehow, since it binds together my love for volcanoes with my passion for the Icelandic horse. I’ll think of something! That actually sounds quite interesting (and delicious). To make it more technical you can always go for “On the viscosity of fry bread dough”. I would like more of your model and prognos for Barda.. I actually read an article once comparing the vesicles of bread dough with that of ejected rhyolite. Agung alert level lowered to 3. Lava dome at Kadovar collapses. Big harmonic tremor ongoing on the Sangean Api graph. Volcanic or weather related (there are some thunderstorms in the area)? Looking at the histogram, they have been recording a number of “flood vibrations” (as described by giggle translate) since early Jan and it does look like the flooding signatures that we’ve seen at Agung. It has however been exhibiting harmonic and volcanic tremors as well, so i do not claim its rain related with 100% certainty. While we are on the histogram legend titles – has anyone got a good translation for what Hembusan is? Giggle has it as blowing, although if you stick vulkanic either side it then translates as either gusts or blasts. I guessing that it means wind? maybe phreatic explosions? this is absolutely a guess. I don’t speak the language. Many thanks Albert, thought so but with giggle showing it as blast was not entirely sure. Dunno about there, but there were here. Slept like a baby. Fully agravated at NBCs PATHETIC Olympic coverage. I want to see Alpine downhill but I’m stuck with nothing but curling and biathlon. I did see an odd womens hockey game between the US and Finland. I fully expected the Finns to decimate the US team, but they were able to maintain control of the puck and stay near the Finnish goal all the time. Both sides had a successful shot rate of 5%, but the US had about twice the shot attempts, so it was at 2-1 near the end of regulation play. In a move that astounds me, towards the end the Finns traded out their goalie for an extra attacker to try and force a tie. Bad move with the way the US kept gaining control of the puck. Sure enough, they got a run back into Finnish territory against an unguarded goal. Too bad, the Finnish goalie was phenomenal. 40+ blocked shots in that one game. The US won, but I sure didn’t expect it. I had already consoled myself to the idea of a loss with the idea that if you’re gonna get taken out of the running, as long as it were the Finns and you had put in a good showing for yourself, at least it was honorable. To me, it’s a cross between darts and pool, but you get to stand on the table. And I have to admit, some of the adverts are mind benders. The Geico cavemen sweeping the ice was odd… and the Sumo figure skater made me look twice. Mr T. A man whose first claim to fame was in midget tossing…. Strong activity in Azores. +300 earthquakes between 1,9 e 3,6 in 5 or 6 hours. Do you have a link to the source of this information? A swarm of earthquakes has started La Palma in the vicinity of Tanganasoga. Interesting that they all seem to be around the same depth 25-30 km. Last Saturday, the 10th, at 23:23 TU a new seismic series was started located in the southeast of the island of La Palma. Up to the present time (day 12 at 11:00 TU) a total of 9 earthquakes have been located, with magnitudes between 2.2 and 2.6 mbLg and depth around 30 km. new post is up. VC does not do disaster stories. But if we did, it would probably be the worst disaster stories in the world.